My in-laws live in the city of Conroe, Texas, north of Houston. It's also the hometown of a very successful brewery startup, Southern Star Brewing, whose canned beers are now distributed in Texas and eight other states. A couple of years ago Carla was visiting her family and brought me a tall-boy of their first offering, Pine Belt Pale Ale. On this summer's trip to Texas, I discovered that they are now distributing a couple of more varieties: Buried Hatchet Imperial Stout, and Bombshell Blonde Golden Ale. Southern Star opens to the public for tasting Saturdays from 1 PM to 3 PM. This month (July 2010), they're open every Saturday, but apparently the schedule changes, so check the website. 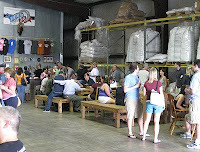 Some people we talked to in Austin said that the tasting hours would be pretty sparsely attended, but there was a large happy crowd when my brother-in-law and I showed up there last Saturday. There were at least a hundred people there at the peak, enjoying the generous free samples. We got into the merchandise line to buy a couple of 21-ounce Southern Star tulip pint glasses, then got into the longer drink line to get a sample and our ratio of wooden nickels for our visit. They had the three flavors mentioned above on tap. The tasting is a great time. The whole warehouse-sized brewery is open, so there you are surrounded by the fermenters, sacks of malt, and stacked pallets of canned product. There are a good number of large picnic tables and benches, but it was standing-room only when we were there. Out back a couple of guys were manning the grills, selling beer brats, smoked pork loin, and hamburgers. A beer brat on a stick is a mere $2, quite a bargain. I liked Pine Belt Pale Ale when I tried it a couple years ago, and on Saturday I thought it might even have improved some since that time. The other beers are also very good. Buried Hatchet is a robust but easy-drinking stout. I called it an imperial stout above, but it's only 8.25% and Southern Star calls it an "American Strong Stout". The dark malts give it very noticeable cocoa and coffee flavors. It definitely appeals to the beer geek faction. The Bombshell goes the other direction -- a lighter, less hoppy ale that might bring in a broader audience, but which still has plenty of malt flavor. I thought the 16-ounce cans were such a good idea that I'm surprised the two new beers are sold in 12-ounce cans -- four-packs of the stout and six-packs of the blonde. Even more puzzling is the fact that six-packs of the lighter Bombshell are more expensive than the bigger six-packs of Pine Belt Pale Ale. 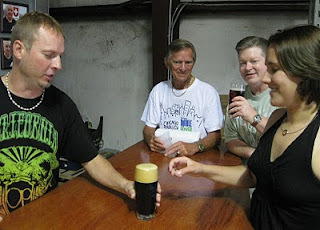 Southern Star has a smoked porter in the works -- part of their "Pro-Am" homebrewer collaboration series. They didn't have it available Saturday, but apparently it will be out soon, and will be sold in 22-ounce bottles. When in Texas, definitely seek out Southern Star beers. And if you happen to be in the Conroe area on a Saturday, I highly recommend a trip to the brewery. I had the Imperial Stout when I was in Austin. If I remember it was a bit thin, and the color was light for an IS, but it really had a good chocolate flavor. The Blonde on the other hand, not that great, a bit metallic if I recall. The stout is definitely not a thick, leggy one like Caldera's or Abyss. Which is why I think they didn't call it imperial. I brought back a few cans of the blonde, we can try it here and see about that metallic taste. I didn't notice it but I'm not always the most reliable observer.